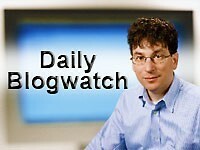 Daily Blogwatch: The Tiger Woods stock index; five CEOs worth their fat paychecks. Very funny. Groom changes his Facebook relationship status from the altar. Exclusive interview with Fox Business Network Happy Hour co-host Eric Bolling. And just to mention, I'll be on the show tomorrow. I am so sick of the arguments about executive pay. Here are five top CEOs worth their fat paychecks. More details on super investor John Paulson's positions in banks, merger arbitrage, etc. Great list of 10 low P/E companies from Modern Graham. Nike (NKE) is poised for a nice run into Christmas. Ten amazingly wasteful stimulus projects from the Obama stimulus plan. Will the Tiger Woods Stock Index survive his current troubles? Stanley Bing wants less doom and gloom talk in 201 0 -- and more Carla Bruni. The greatest financial deception in history.